London Mayor Says 'Trump Baby' Blimp Can Fly In Protest Of President Trump's Visit Trump is scheduled to visit the U.K. next week. Mayor Sadiq Khan's office says activists who want to fly the 20-foot blimp still need to get approval from police and the national air traffic service. "The only way you can make any kind of impact with Donald Trump is to mock him," says one of the organizers behind the "Let Trump Baby Fly" petition. "The Mayor supports the right to peaceful protest and understands that this can take many different forms. ... However the organisers will also need to receive the necessary approvals from the Metropolitan Police and national air traffic service in order for it to fly," a spokesperson for Khan tells NPR. The blimp, which will be tethered to the ground, will be allowed to fly for two hours at a maximum height of about 100 feet, says organizer Leo Murray, who conceived of the idea of a Trump Baby blimp. Another protest organizer, Max Wakefield, says the London authority initially objected to the idea. "They just said, it's not going to work, and that's the end of it," Wakefield says. But for the activists behind the blimp, that wasn't the end of it at all. 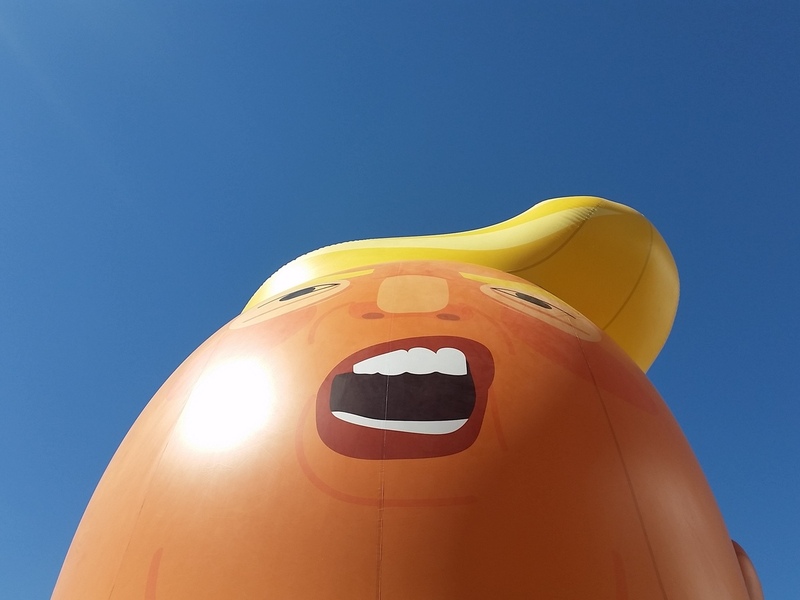 They launched an online petition to "Let Trump Baby Fly," garnering thousands of signatures and a fair amount of media attention. Wakefield says, "Quite quickly after we managed to get some media interest, it didn't take very long for this to blow up — excuse the pun." Organizers say they are still getting all the requisite approvals to fly the blimp. But in some ways, Wakefield says, they've already accomplished the goal of getting out their message. "Behind all of the humor and the creativity is a really serious message for us," Wakefield says. "This isn't just about Trump, this is about the rise of far-right politics that dehumanizes people in order to get into power." He mentioned the detention of immigrant children in the U.S. and Trump's decision to pull out of the Paris climate agreement as among the reasons for the protest. As for the method, Wakefield says: "The only way that you can make any impact with Donald Trump is to mock him, because you can't engage him in any kind of argument — it never gets anywhere." "This is an attempt to introduce some good British humor into the political discourse surrounding Trump's visit," he says. As NPR's Laurel Wamsley reported last year, "In January, Prime Minister Theresa May invited Trump for a state visit — an invitation that drew immediate criticism. A petition to prevent Trump from making an official state visit "because it would cause embarrassment to Her Majesty the Queen" drew nearly 2 million signatures and received parlimentary debate in February. Khan has also been critical of a Trump visit, tweeting last fall that "it's increasingly clear that any official visit from President Trump to Britain would not be welcomed." The July 13 airborne protest will coincide with a more traditional one on the ground: a "Stop Trump" march through central London. We previously posted a correction that said President Trump will be arriving in London on July 13 for a three-day visit to the U.K. The president is expected to arrive in London on July 12 for a 3 1/2-day U.K. visit.